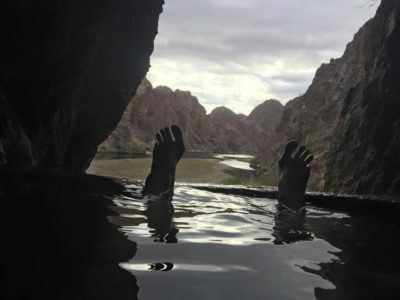 Imagine canoeing down a very calm, slow moving stretch of the Colorado River through awe inspiring canyons with 4 different hot spring locations, a sauna cave, great food, the Hoover Dam, hiking, swimming, petroglyphs, stars, and so much more! Call 415.669.2600 to sign up today! This is either a 3 or 4 day guided adventure – depending on your date – where Blue Waters will provide knowledgeable/ awesome guides, meals, tables, chairs, water, firewood, and all gear needed for canoeing (canoe, PFD, paddle, and 1 large dry bag per person for your camping gear – 109 litres). We meet at 7am on the first day to load our gear into our 109 litre dry bags, and get paddle ready. At 8am we will leave the parking lot to launch our canoes at the base of the Hoover Dam where your adventure truly begins. 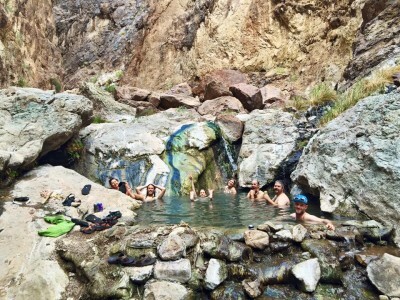 Just a few ways our time will be spent include soaking in hot springs, hiking, relaxing, and exploring. Guests are encouraged to stay at the Hoover Dam Lodge the night before our departure since it is the location of our shuttle pick up, and is reasonably priced with recent upgrades. 7 am – Meet at paddle craft area across from the Hoover Dam Lodge in Boulder City, NV. This is the staging area directly across the street from the Hoover Dam Lodge. Guests arriving the night before will be issued a 109 litre dry bag. 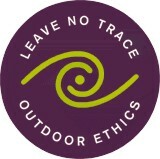 Please pack this bag with all of your camping gear prior to meeting. Please have your ID with you for the shuttle, and in an easily accessible place. 8 am – We will load in to the shuttle vans to head to the launch. At the launch we are allotted 15 minutes to load into our canoes and launch. Once we launch, our first stop will be a sauna cave located a few minutes downstream. 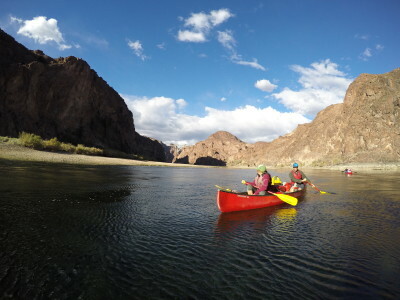 We will continue paddling down the river to Gold Strike canyon where we will enjoy a soak in the hot springs and hiking. 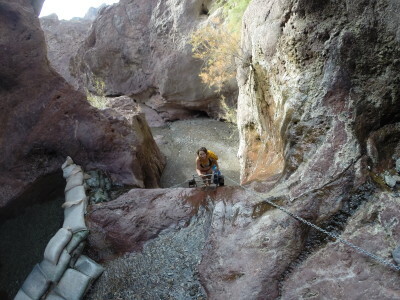 From here, we will continue on to Arizona Hot Springs where we will be camped for the next two days. 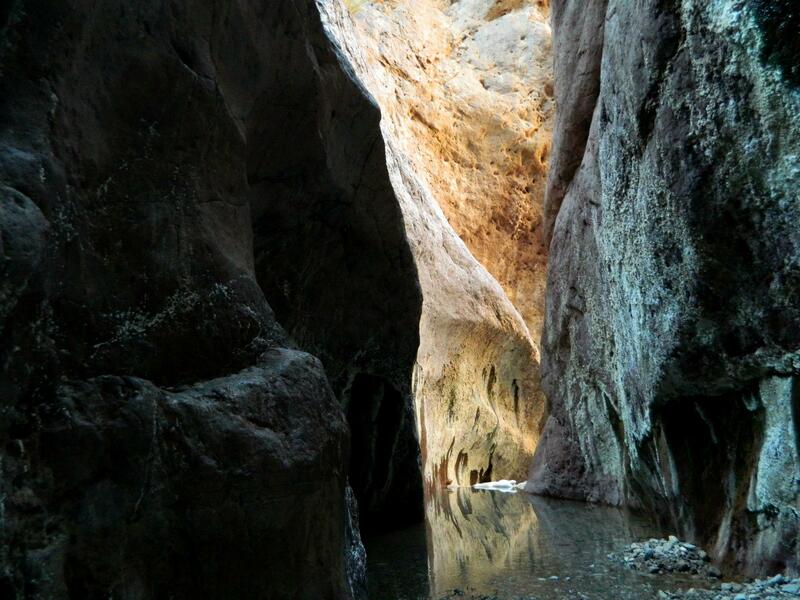 After setting up camp, guests are free to hike around or enjoy a soak. 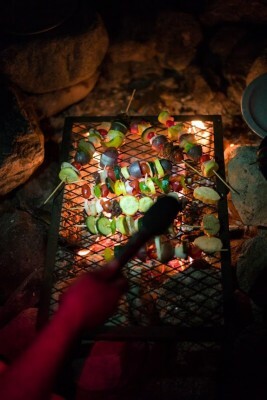 7 pm – Dinner will be prepared and campfire desserts served in the evening. 8:30 am – Breakfast is served with hot coffee, teas and fresh juices. 10 am – Guests will have 3 options for how to spend the rest of their day. ~Option 3 – Relax at camp. For guests that join the hike or paddle, we will pack lunches to enjoy while we are out for the day. 7 pm – We will all gather back at camp for dinner and fireside enjoyment. 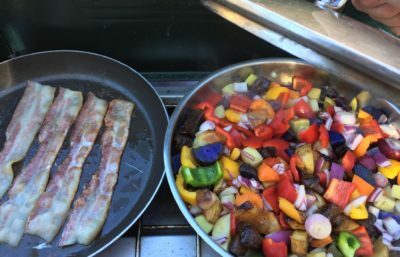 8 am – On our final day in the Black Canyon Wilderness we will pack up our camp, enjoy a nice breakfast and make our way down the last 7 miles to the take out at Willow Creek. 10 am – Depart from camp exploring old gauging stations, and other fantastic areas along the way. 3:30 pm – Scheduled shuttle pick up time at Willow Beach. If guests will be flying out of the Las Vegas airport they should schedule flights for no earlier than 7:30 pm. Breakfast – light snacks of granola bars, fruit with hot beverages. *Adjustments can be made for dietary considerations. Please let us know at the time of booking.